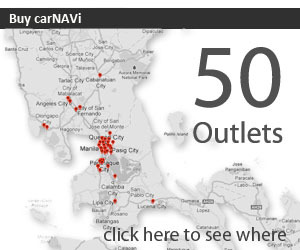 carNAVi builds GPS navigation solutions for the Philippine market, that works straight out of the box. 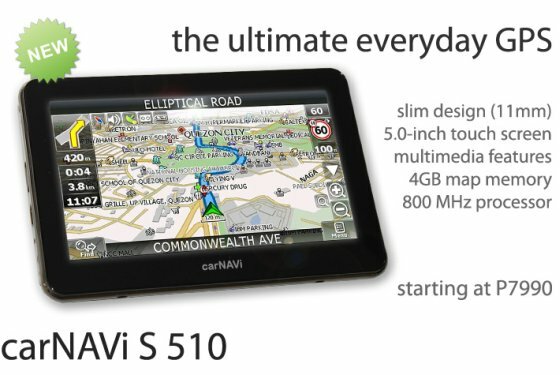 With the new S 510 portable GPS, carNAVi Corporation upgrades the ultimate S-series. The S510 gets a faster CPU, more memory and a slimmer body. The all new S 510 comes with a large 5-inch flat touch screen and the developers have upgraded the GPS processor to 800MHz. More working memory beside its 4GB expandable memory to store navigation maps and multimedia makes this GPS the most advanced in the market. This stylish new navigation device is available now for a revolutionary price. carNAVi S 510 leads drivers with voice guided turn-by-turn directions in English or Tagalog to get them there, on time and safe. Preloaded with the latest high quality roadmaps covering the entire Philippines including thousands of points of interest (POI) with perfected localized routing and street name search, it’s compact, versatile and easy to use. 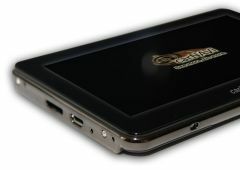 carNAVi S 510 has a stylish ultra slim design (only 11mm) with a large 5-inch widescreen display. Outside the car its rechargeable lithium-polymer battery makes it convenient for mobile navigation on foot with up to 4 hours’ usage between charges. Powered by the latest 800MHz DUAL CORE GPS processor with 256MB RAM and 4GB build in memory for navigation maps, carNAVi S 510 is faster than most other GPS receiver. 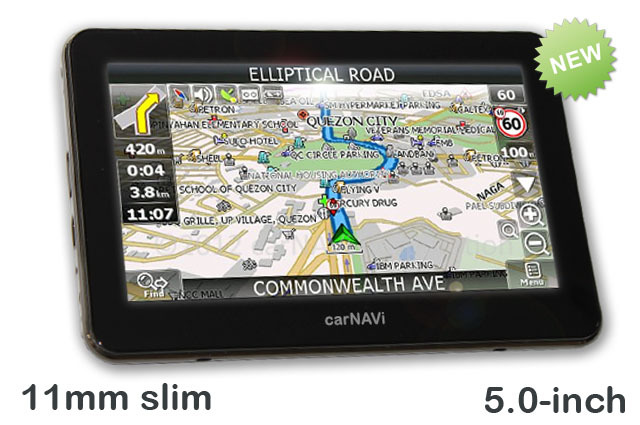 carNAVi S 510 GPS navigation units will be available now for only PHP7.990 in the Philippines.